Buster Shaw, former instructor, board member and long time friend of the Brookfield Craft Center has endowed a scholarship in Woodturning with the center. Members of the community are welcomed to make donations in lieu of flowers and to honor Buster’s commitment to sharing his love of the art of Woodturning with others. A notice of your donation will be sent to the family and all contributions to the scholarship fund are fully tax deductible. The Brookfield Craft Center is proud to facilitate this opportunity to honor Buster’s memory and offer students the opportunity to learn new skills and gain an appreciation for the creative process specific to wood turning. Each year the Brookfield Craft Center will award three scholarships, one in each of the 2nd, 3rd and 4th quarters of the calendar year. The scholarship will cover all tuition and materials fees. If you are interested in applying for the scholarship download the application with instructions here. Deadlines to apply are the first day of March, June and September. To make a donation please click the donate button below. Sponsored by the Buster Shaw Scholarship for Woodturning The Brookfield Craft Center is pleased to offer a free workshop in its Woodturning program. This opportunity is offered in honor of Buster Shaw, former instructor, Board member and longtime friend of the Brookfield Craft Center. 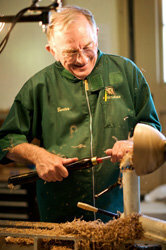 Each year the Brookfield Craft Center will offer a weekend woodturning workshop at no cost. This workshop is intended for those who otherwise would not explore their interest in this craft. All tuition and materials fees are covered by the Buster Shaw Woodturning Scholarship fund. The Brookfield Craft Center offers this opportunity so that the student may learn new skills and gain an appreciation for the creative process and in woodturning in particular. Interested individuals will be chosen by a panel as defined by the Buster Shaw Scholarship Fund. The panel will review the applications and select those that reflect the strongest desire and ability to further develop their skills and interest in Woodturning. It is the hope that by taking a workshop at the Brookfield Craft Center, the recipients will be inspired to continue the creative journey and develop a life-long passion for craft. Please tell us why you are interested in taking a woodturning workshop at the Brookfield Craft Center.